Our church is currently working through a new adult home group / discipleship program that involves teaching the same courses in four sessions throughout one year. I’m currently in the middle of my second session, teaching from “Worship Theory.” In my current session, I suddenly find myself referring to information that I started when I began the book project; information on worship leading. My working title for the project for the bulk of its progress was “The Laws of Worship,” which would be supplemented by “The Laws of Worship Leading.” Though I changed the title of the book because I realized I couldn’t claim my thoughts as laws because they really aren’t “tested by time” like John Maxwell’s various laws, I would have to say that the Laws of Worship Leading are different. You can go from style to style, church to church, and if a worship leader should ignore these “laws,” it could result in quite a mess. I should also warn you that some of these thoughts might come across a little rough, or perhaps like I’m trying to “quench the Spirit,” man-oriented, prideful, or some other negative description that you might initially come up with. I’ll try to keep the explanation as clear and precise as possible, but be patient with me as I get it out. Because I’m not taking as much time in preparing these thoughts as I did the theories in the book, they may come out like a smorgasbord of different ideas. As always, if you have any questions, post a comment and I’ll get back to it. 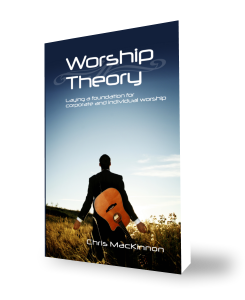 We may also run across some terms and concepts that come from the book, Worship Theory. I apologize if they confuse you; but it’s kind of what I’ve been working with for a number of years, so it just comes out. In the book, we discuss The Theory of the Individual, which states, “Because everyone is different, each person approaches worship differently.” This is a loaded statement with many implications, one of them directly relating to the Law of the Conductor. The Law of the Conductor tells us, There must only be one leader directing the worship experience and environment. Our worship teams have evolved from a vocalist at an organ to teams of musicians and vocalists. In many churches, there may be more than one worship leader in the team from service to service. As we have trained our worship team members through books, seminars, bringing in popular worship teams and leaders, it is our hope that they have grown in their experience, knowledge, and abilities that pertain to worship leading. Of course, like any experience with God, we each relate to the experience differently. We’ve learned to listen to and accept the emotional and spiritual responses inside of us, and we’re all too apt to follow our own inclinations. What if we all started to take the worship experience in the direction that each of us feels is best because that is where we, ourselves, feel like we need to go? The result would be chaos. In one church I served in, my family arrived the same week as a band the pastor had learned about through the Christian owner of a nearby music store. The next week we were thrown together, completely new to each other, and became the church’s worship team, along with the organist and two vocalists that made up the current team. Over the next year, we had many services where I would be leading the team, and the leader of the band would suddenly take the worship in a different direction. As time passed, a schism grew in the worship team. I use the idea of the conductor, because if I were to visit Orchestra Hall in downtown Minneapolis for a performance, I would expect to only find one conductor. In such a setting, there can only be one conductor. Why? Because each individual conductor places stresses on different movements of the piece in different ways. In reality, a worship leader is the conductor of the worship experience. Now, I realize that some red lights just went off in some heads following that statement. It is true that the Holy Spirit directs our worship experience, but if I were to bring the prophets Hosea, Jeremiah, Ezekiel, and John the Baptist in a room where the Holy Spirit wanted to speak, each would express the word of God differently, each through his own personality. It is my hope that pastors prayerfully consider those they choose to be worship leaders. They should be sensitive to the leading of the Holy Spirit, able to give direction, and I would argue that they be tested. No conductor who stands in front of a well-known orchestra gets to that position because he is the only able to do it, or because she is willing to give it a try. These people are tried and tested on the path to directing an orchestra, or even a choir. If we put someone in charge of worship just because they can sing or play an instrument, but have not shown themselves to be sensitive to the leading of the Spirit, then if someone else on the team is “more” sensitive, troubles can arise. You may have noticed that I’ve tried to consistently used the idea of conducting rather than directing. In an orchestra, each musician has the sheet music already, available at his/her need to practice, memorize, or experiment with on his/her own. In reality, the presence of God, the Holy Spirit, is that sheet music. The conductor just helps the musician keep time, and properly follow that which is already prepared for and available to them. This is great! Looking forward to more!